Axe Bat Company has embraced the new USA Bat Standard by creating their strongest and most durable youth baseball bat ever. The 2018 Axe Elite USA Baseball bat is a hybrid 2-piece construction that encompasses Axe’s Mantic Alloy housed within the 2 5/8 big barrel. This aluminum material comes military grade optimizing pop, sound, and supreme durability. The barrel of the Axe Elite USA bat also features a reengineered design aimed to enlarge the sweet spot and expand the potential for powerful connections over 270-degree region. The composite handle of it features a HyperWhip end cap which decreases weight, increases swing speeds, and extends barrel length. The composite handle is entrenched in Axe’s patented Endogrid technology which when coupled with the firmness of the flex-tuned handle, absorbs shock vibration creating a smooth and comfortable feel like no other. Lastly, it utilizes an end loaded swing weight making it an ideal choice for older and more skilled power hitters. A common trend among some youth baseball bat manufacturers for this inaugural "new" season involves offering a height/weight ratio of -5. The Elite -5 drop is a USA youth bat that is expected to offer hitters one of the more powerful swings for all USA bats. The Axe Bat Company loaded the Elite with more technological features than any youth bat they have ever manufactured. The timing of such innovation couldn’t be more perfect considering how many millions of youth baseball players will be purchasing brand new youth bats this upcoming season. When evaluating this bat, we reserved testing for our older and larger youth players. 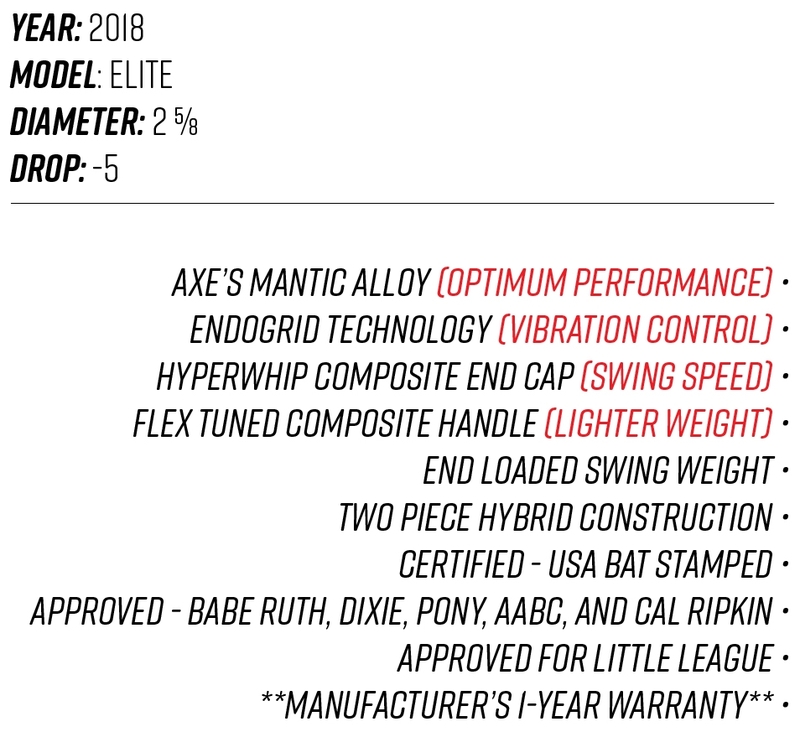 After 275+ solid swings, below is our official review of the 2018 Axe Elite -5 Drop USA youth bat. The #1 reason for adopting the new USA Bat standard over the older USSSA performance standard involves making metal youth baseball bats to perform at “wood-like levels." This results in the new 2018 youth USA bats featuring less pop potential and a smaller trampoline effect when the baseball collides with the bat. Please note, even the most new and powerful USA bat will not drive the baseball as far as little league players have hit in past years. Having said that, it’s unfair to compare the pop of the Elite to older Axe bat models. With that being said, the Elite exhibited more pop than the majority of all of our other USA youth bats we tested. During our evaluations, it ranked in as one of the best USA youth bats in terms of pop. When analyzing how it protects against shock towards the hitter’s hands, we always refer directly to the responses given by our volunteer youth hitters. After reviewing the feedback, the Elite had the fewest negative remarks regarding vibration control than any other youth USA bat we have reviewed thus far. Out of all the hitters who tested out the new bat, less than 3% described experiencing a consistent vibration upon their grip. Much like our Vibration Control score, our results for Grip & Comfort is solely determined by the feedback of our volunteer hitters. The Elite comes with an ultra-light weight handle that met the satisfaction of the majority of hitters. In being a drop -5, most of the negative comments pertained to the heaviness and extra mass in the barrel. It should not be utilized by players new to baseball or have yet to possess the strength to maintain a quick and level swing. As a side note, those youth hitters who marked themselves as "experienced players" of an above average or all-star caliber had zero negative comments about the comfort and feel for the Axe Elite. Not surprisingly, those hitters who noted having less than 2 seasons of baseball in the books were the ones who noted having issues maintaining a level swing and a comfortable/balanced at bat. Our staff was very impressed with the durability of the bat. Axe marketed this particular youth bat as the strongest one they have ever produced. After our vigorous testing procedures, not only did these youth baseball bats have zero cracks, dents or dings, they also displayed the least amount of handling marks and scratches than any other USA bat. It is by far one of the most durable 2018 youth baseball bats available for purchase. The Axe Bat Company has developed a drop -5 USA youth bat that can enhance the performance of players who possess the ability to maintain a level swing. This bat also carries a great value vs. other USA power bats by other manufacturers. The 2018 Axe Elite comes highly recommended for older players as they begin a transition to the BBCOR.